Telecentric Measurement Lenses JENmetar™: Machine vision at its most powerful! Absolute precision, exceptional reliability, and secure handling – JENmetar™ means quality in every aspect for your application. 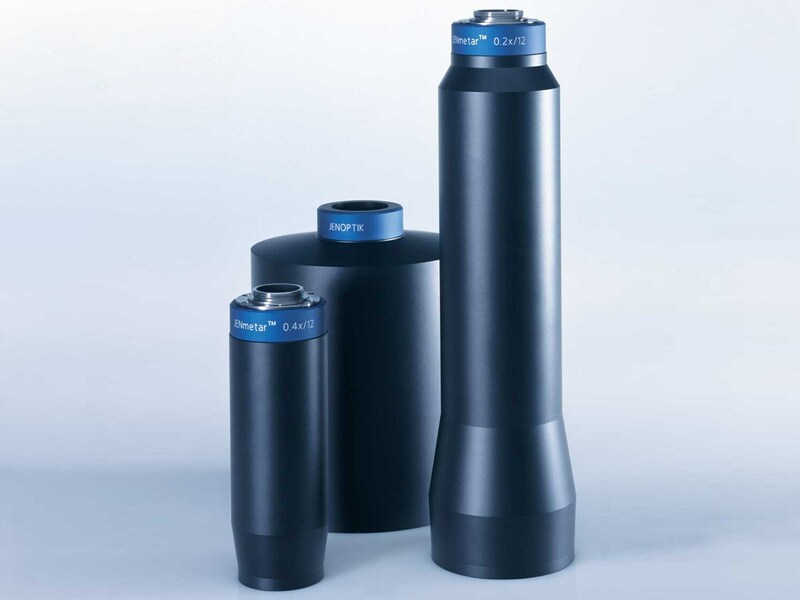 Absolute precision, exceptional reliability, and secure handling – these are the quality characteristics of the JENmetar™ telecentric measurement lenses. The Jenoptik telecentric lenses of this series work on the tried and trusted principle of telecentric projection and are specially developed for the use in quality control and imaging processing applications. Real three-dimensional objects, allowed to move during the measuring process, can be projected with precise geometrical accuracy thanks to the application of strict telecentric principles, extremely low distortion and high image quality. The ratio between image size and object size, where aratio smaller than |1| means reduction and a ratio bigger than |1| magnification. A minus sign for the scale ratio indicates inversion of the image. JENmetar™ telecentric lenses are designed for fixed scaleratios. The scale ratio is determined by the lens design ata fixed flange-to-sensor distance (C-mount as standard). The distance between the object and the edge of the lens mount at which the image is sharpest. 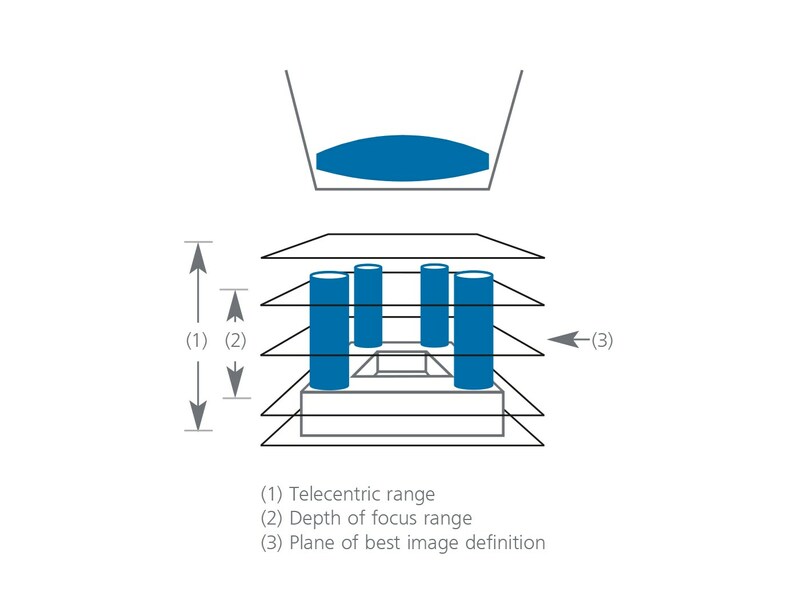 For telecentric lenses this is generally the middle of the useful object distance described by the telecentric range. JENmetar™ telecentric lenses combine convenient working distance with short transfer length. The sine of the half angle of the conical incident light. The photographic term 'speed' or 'F-number' is the equivalent of aperture. The brightness in the image increases with aperture. The aperture also influences resolution capability and depth of focus. Loss of definition through defocusing increases faster at a large aperture than a small one. The ability of an optical instrument to distinguish between two closely positioned object details, for example to reproduce those clearly as two separate entities. Resolution capability is dependent on object and contrast. So figures quoted should only be regarded as arough guide. For laterally extended structures, the Abbe formula λ / (2*NA) can be used for the resolution limit. This is achieved by JENmetar™ lenses through their excellent image quality. The projection of a sharp edge where there is an ideal jump in intensity from 0 to 1 is blurred in the image, for example is reproduced with an intensity profile. 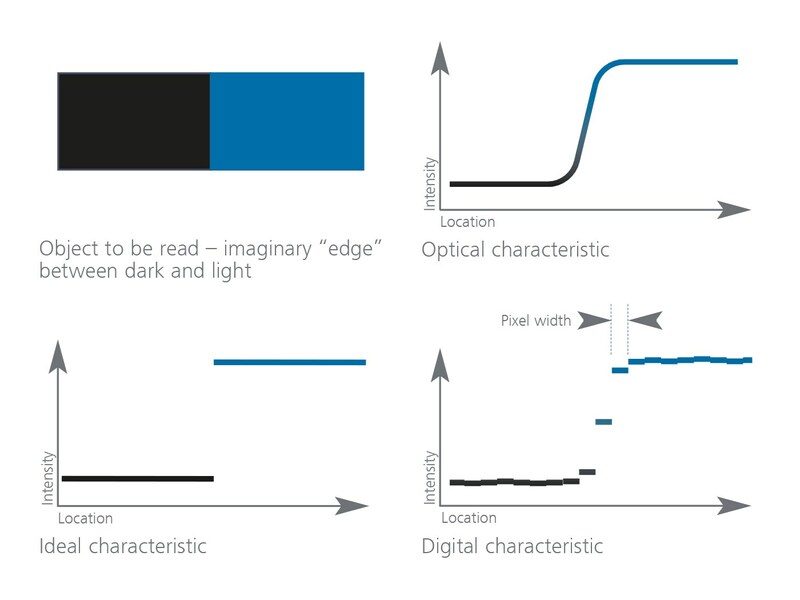 The width of blurring edge is an application-oriented measure for describing the resolution capability of a lens. For JENmetar™ telecentric lenses, edge blurring is defined in the intensity range from 10 to 90 percent. The intensity distribution is digitized in the case of a CCD receiver. The spatial appearance of an object or structure when projected onto an image plane. One aspect that is vital for the perspective of optical systems is the position of the perspective center relative to the object. A distinction is made between central perspective and parallel perspective. ln the latter case the perspective center is at infinity, one then speaks of a telecentric optical path. The geometric distance between the object plane (detectorarray) and the image plane when the image is atits sharpest. Taking into account the call for smaller testsetups, the short transfer length of JENmetar™ lenses provides a comfortable working distance. A projection in which the real image does not deviate in any way from the geometrically similar, for example undistorted, ideal image. This feature is realized by all JENmetar™ objectives for real three dimensional objects.Low distortion and high Ievel of telecentricity are the basic requirements for true geometric projection. Special form of perspective that uses the principle of parallel projection (parallel to the optical axis). Objects of the same size but at different distances appear of the same size, for example the scale ratio remains constant when the distance of the object changes. The deviation from the geometric similarity between object and image (refer also to "Geometrically true projection").The distortion of JENmetar™ lenses is negligible (distortion-free lenses). The range along the optical axis in which a specific degree of edge blurring is not exceeded. ln data sheets forJENmetar™ lenses the depth of focus range is specified for edge blurring of 11 μm and 50 μm. The range in which the object distance can change without the permitted image displacement is mentioned in the footnotes of the datasheets. 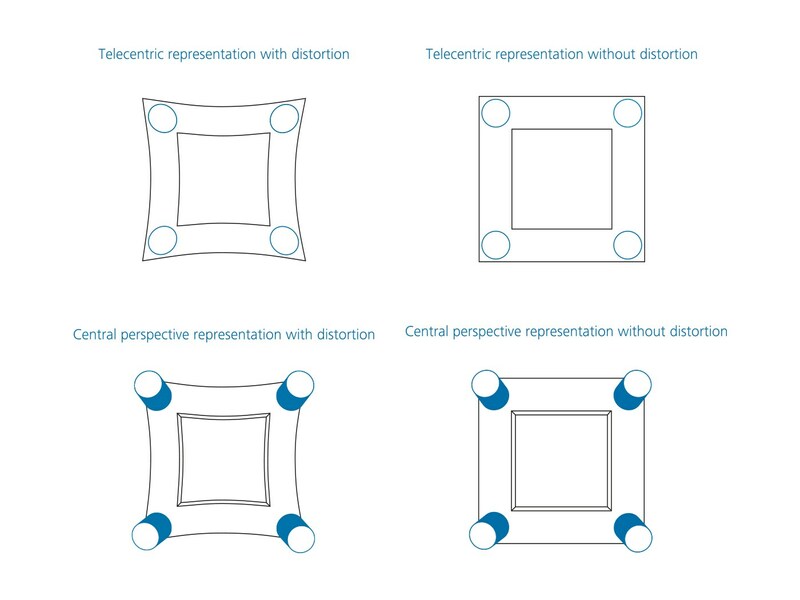 The depth of focus can be smaller at the Iimits of the telecentric range.